Unit 3, Block 4, Lot 1; TOT ID# 1622. 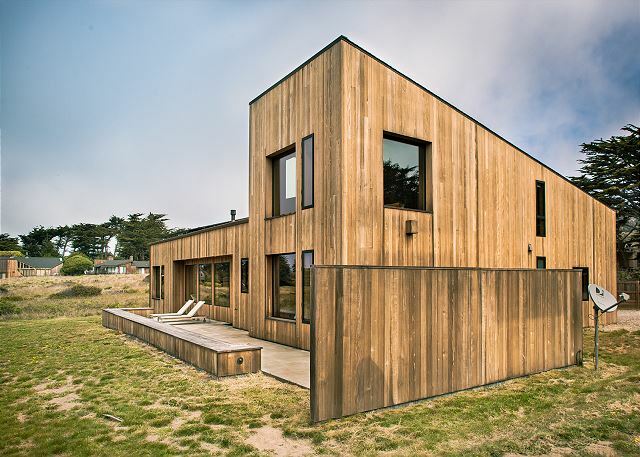 Poised on the bluff trail at the North end of Black Point Beach, Horizon Reach is a new residence designed by Barry Elbasani, FAIA. Surrounded by common lands on three sides and a cypress hedgerow to the south, guests enjoy privacy as well as a breathtaking view of the Pacific from all bedrooms and the combined living/dining/kitchen great room. Horizon Reach is designed with 3 separate master suites. Direct TV (including the NFL Sunday Ticket) is throughout the house, with a DVR in the living room. There is free wireless internet so that you can keep as in touch with the outside world as you want to be. 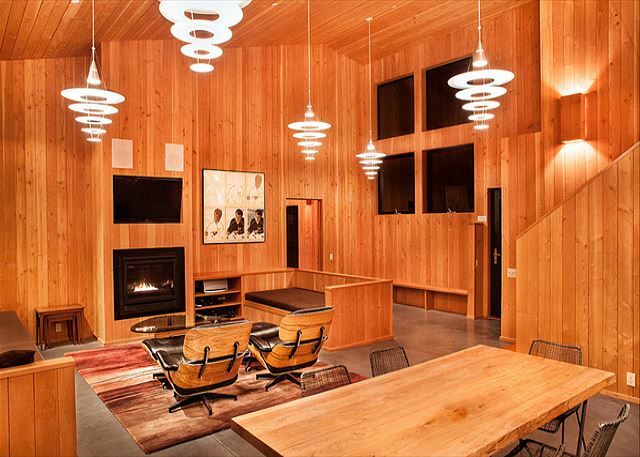 Each suite and the great room have their own thermostat to control the radiant heating to your own preference. The floors of the main level are polished concrete, while the upper levels are teak hardwood. The expansive windows are all double-paned for insulation, keeping Horizon Reach cozy. The North suite features a King bed, a second floor loft with twin beds and a 42” flat-screen TV. 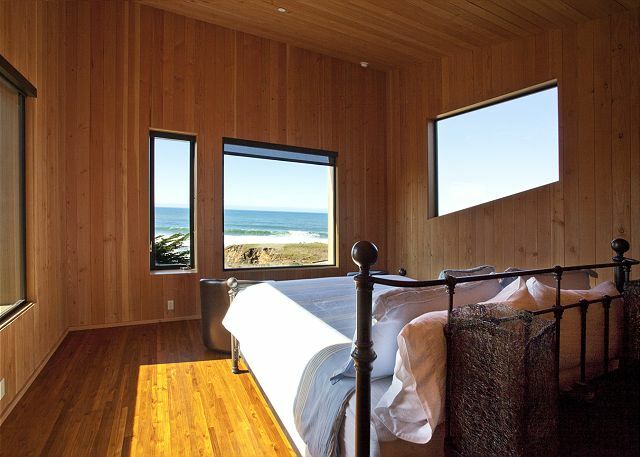 Views from the king bed are of the Pacific’s swell and surf to the west and the meadow to the north. 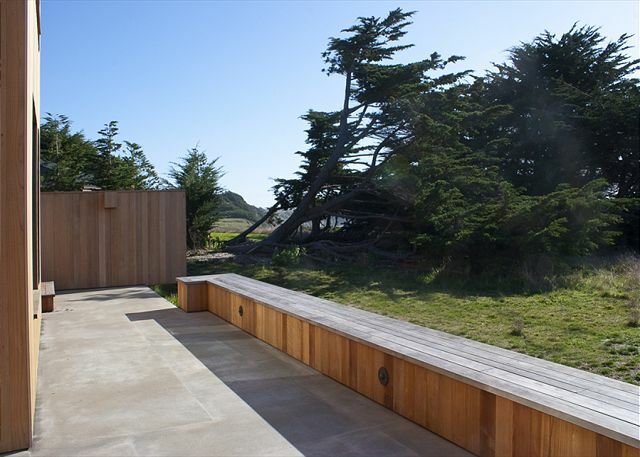 Views from the loft are of the meadow and ocean to the north and west, and the cypress trees to the east. An area between the bedroom and bathroom has a built-in desk and built-in sofa with large windows to the north for quiet relaxation. At this desk is and all-in-one printer/copier/fax for your convenience. 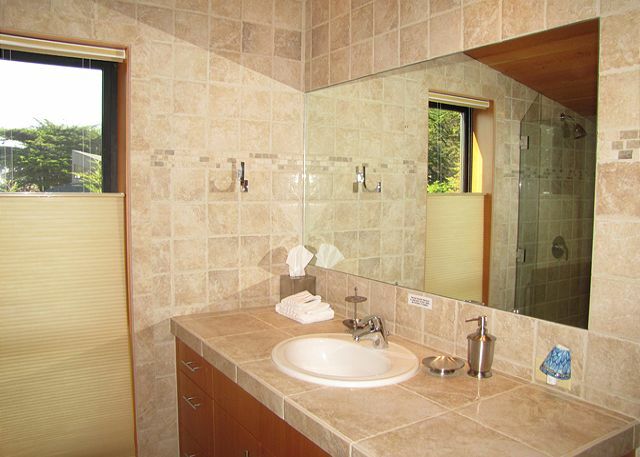 The en-suite bathroom features double sinks, a walk-in shower and separate soaking tub. 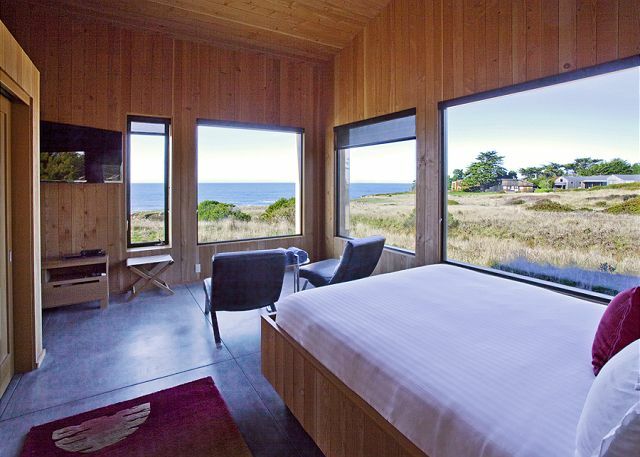 The first floor south bedroom features a king bed, a 55” flat-screen TV, and a seating area to view the ocean and wildlife. The en-suite bathroom has a deep soaking tub with shower. 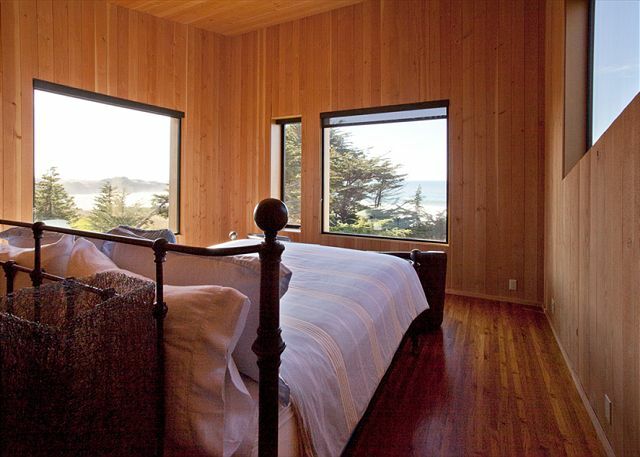 The second floor south bedroom features a Stearns and Foster king-sized bed centered in the room to optimize the view. To the south you can watch the surf roll in on Black Point Beach, to the west watch the swell and surf as it approaches the beach and to the north see the stars by night and the sky by day. 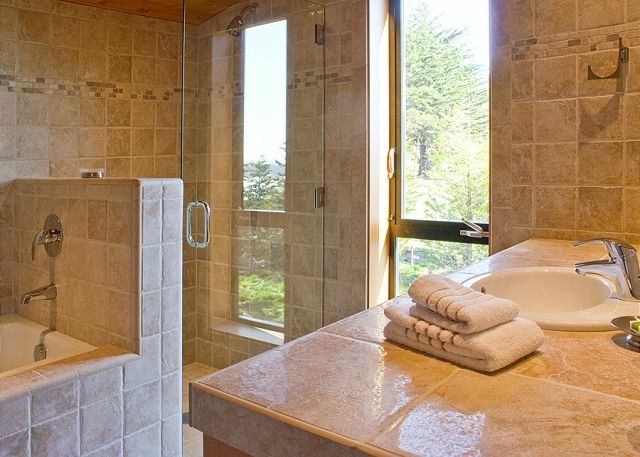 The en-suite bathroom features a Jacuzzi tub and separate shower, with ocean view. Bed linens and towels are included with this rental. Also on the second level is a 20’ X 20’ private sundeck facing the east with views of the trees and the mountains. It is a lovely spot to sunbath by day and star-gaze at night. 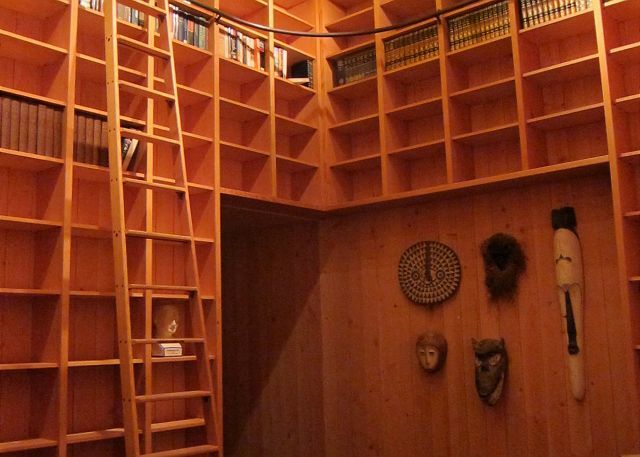 Additional common spaces are a library and a pool room. 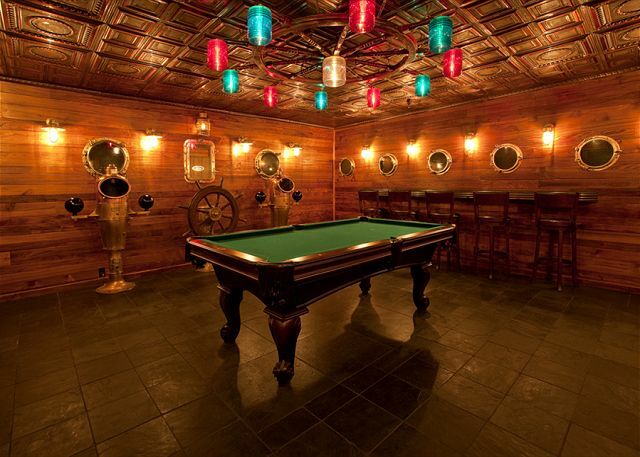 The pool room features an Olhausen 7’ pool table, slate floors, teak paneling, tin ceiling and a nautical motif. The kitchen is designed with the cook in mind. It is equipped with Viking appliances (induction stovetop, double ovens, microwave, and refrigerator), All-Clad cookware, KitchenAid stand mixer and hand mixer, Cuisinart food processor and mini-chop. 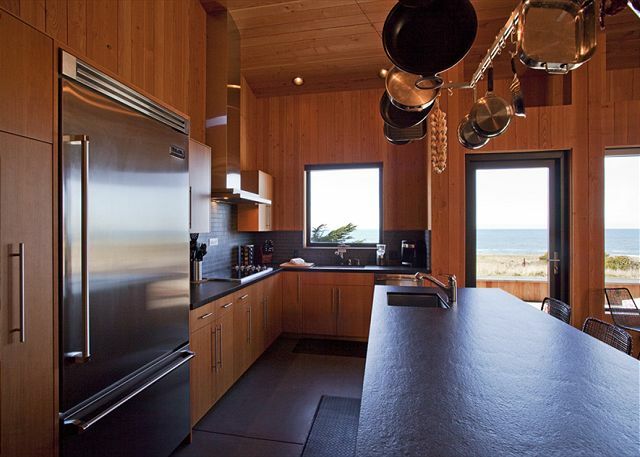 The Kitchen has two separate sinks – a prep sink in the island and a clean-up sink (with an ocean view!). The countertops are river-washed granite. The kitchen island separates the kitchen from the dining area and has 4 counter stools for casual dining. The dining area has a Rosewood dining table and seating for 8. The living area follows the tradition of Sea Ranch with 14’ of built-in sofas along the window wall as well as another 7’ built-in sofa defining the entry hallway. 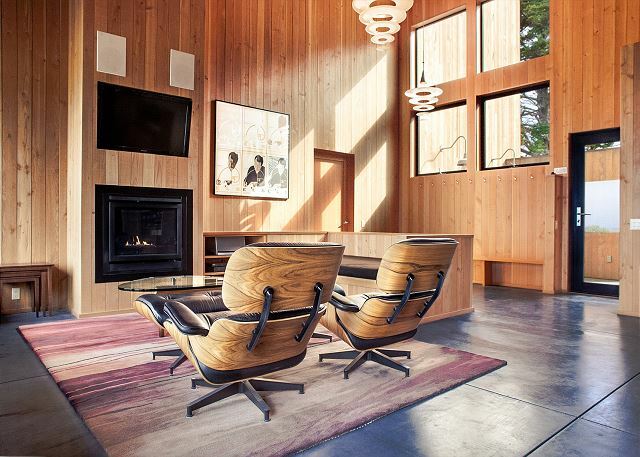 Additional comfort can be enjoyed in two Eames chairs. 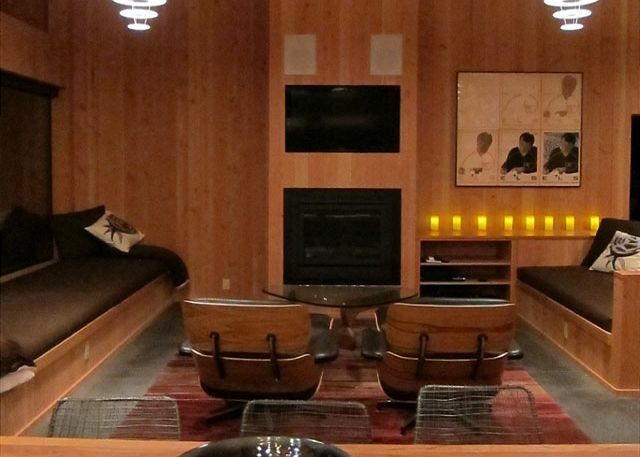 For cozy nights, there is a gas fireplace with a home theater system (iPod ready). 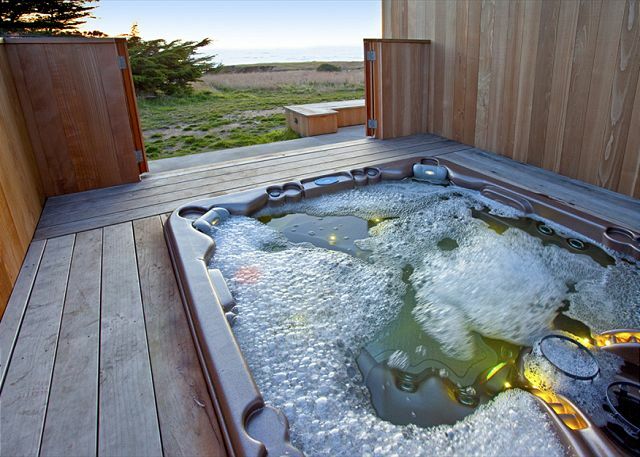 Facing the ocean, the hot tub seats 8 and enjoys great sunset views and whale watching (in season). Also, it is another great venue for star-gazing. Bed linens and towels are included with this rental. Due to the close proximity to the ocean bluffs, homeowner suggests guests age 8 and older occupy this home rental. We stayed for 7 nights over xmas and had a splendid time. The kitchen lacks for nothing (which is a nice change from many rental houses) and the huge living/dining room was the perfect gathering place at the end of the day. The quirky nautical/billiards room obliterate that sterility that some vacation homes have, and each room offers a lot of privacy (except the loft above the master, but I assume that's for kids, which we don't have, so it went unused). The wifi was only working in the master bedroom when we arrived and it took four days before the internet provider could come out and fix the problem, and it sure would be nice to have a barbecue (apparently there's a fire-related reason that's not possible), but other than those minor quibbles, we could not have been happier. 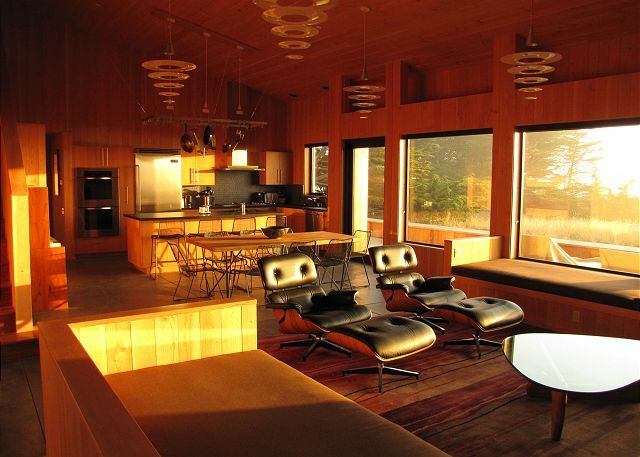 This is definitely the most gorgeous and spacious house I have stayed in in Sea Ranch. However, many of the light bulbs were out, including those in the upper bedroom and on the ceiling above the dining room. The home is quite dim making it impossible to read. The microwave is so low to the ground that it requires you to sit on the floor with a flashlight just to see the controls. The front door is impossible to lock or unlock. A set of instructions for this complex a home would have been very nice. Other than that, everything was perfect. I would rent it again. Finally the house we've been looking for. This house is absolutely ideal for 2 and even 3 couples- each with a wonderful view and bathroom. The kitchen is equipped with everything a cook/chef would want, even a zester. Great easy access to the walking paths and gorgeous views from every room. Fabulous time, once again. So grateful to the owners for sharing their beautiful home with all its gracious amenities with us! We love to cook and stare out at the view. And we love to star gaze from the upper deck. Of course, the walks are fabulous; we spend more time on the trail than indoors! Also thanks to the staff at Beach Rentals for so cheerfully and charmingly handling our arrangements. Much appreciated! Loel, Rob, Jimmy, Colby and Cole and Reggie, the canine therapy dog, who guarded the house from raccoons and found a paper wasp nest in the ground -- ouch! Again, thanks. What a wonderful vacation. We enjoyed all of this home's amenities and location. Thank you for sharing! We recently rented the Horizon Reach home for 3 nights for a girls trip and had the BEST weekend imaginable. The home has breathtaking views from nearly every room, is stocked with appliances, tools, extra batteries, linens, beach equipment, games, books and so much more. The home was clean and functional and even with 8 of us still felt spacious. The property management company was friendly and helpful through the whole process as well. We will definitely recommend this home to our friends and family. Horizon Reach is a wonderfully situated house with views of the ocean from every room. The kitchen has everything to stay in and cook as well. 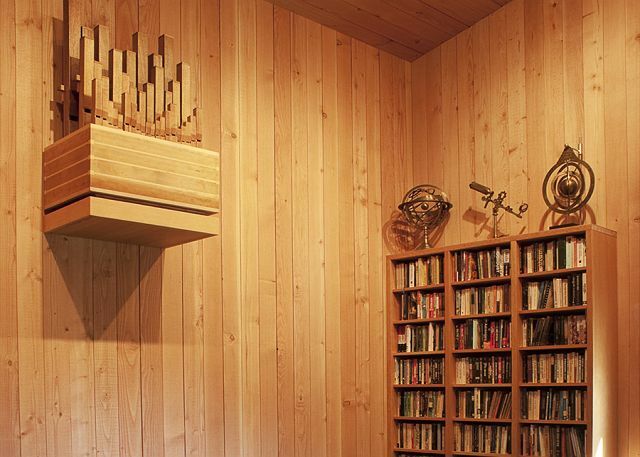 The beauty is in the details; the way the sun plays through the house, the organ in the library, the themed game room all contribute to a wonderful experience. Staying at Horizon Reach was more than we expected. The rental was beautiful with some very nice bonuses beyond the incredible view, and access to arguably the most beautiful hiking trail in the world. The pool table room was unbelievable, and the library and automatic pipe player in the extensive library provided bonus entertainment for our stay. We spent 5 days in this lovely home with family and friends. It easily accomidates 8 guest comfortably. This house became the gathering place for others who had traveled from across the country for our son and now daughter-in-law’s wedding. The unanimous decision of all guest spread over 3 houses was that Horizon Reach was by far the favorite. It allows for larger numbers to mingle comfortably, comfort, privacy, and a spectacular view! The wedding, at the Sea Ranch Chapel, was perfect in every way and Horizon Reach provided the perfect setting to celebrate the newlyweds! 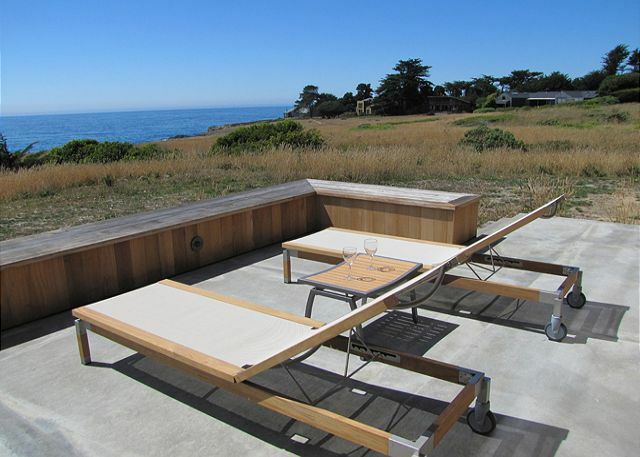 This was our 6th annual trip to Sea Ranch but our first time using Sea Ranch Rentals. The house was spectacular! We received wonderful service and are already planning our return trip! We thoroughly enjoyed our stay at Horizon Reach. The house is comfortable and very private. The proximity to the ocean and walking path was an added bonus. We loved all the windows and the open feel. We've stayed at this house twice and love it. 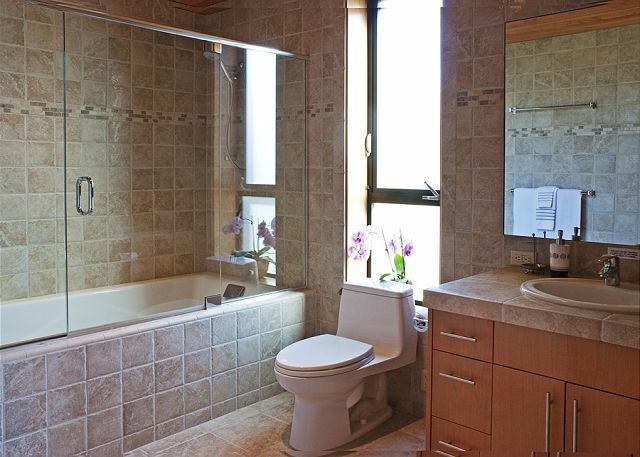 It's great for 3 couples because each bedroom has its own bathroom. And it's absolutely beautiful. 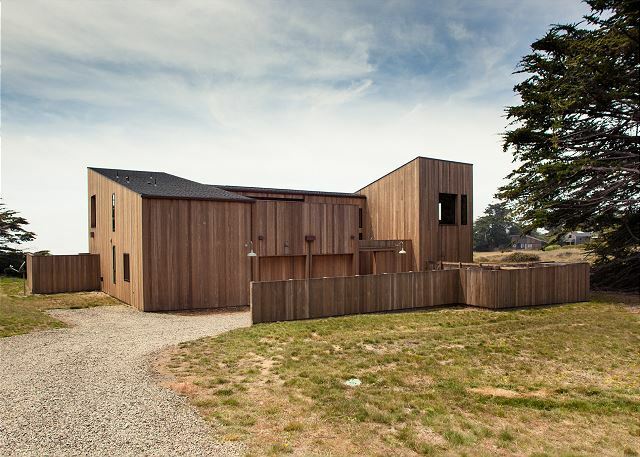 Even though the house is very new, it really speaks to the original design intent of Sea Ranch. 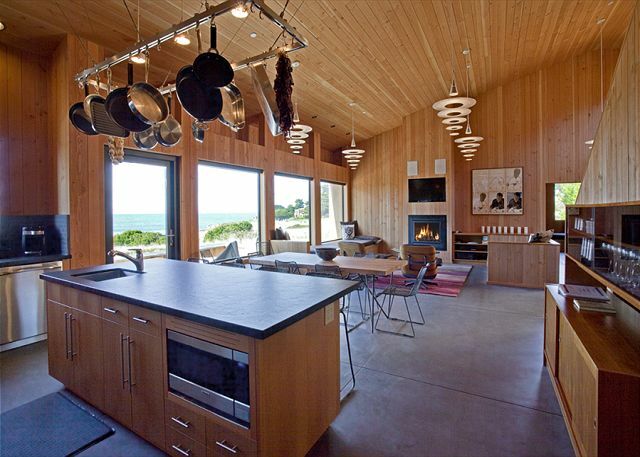 There are too many Sea Ranch houses that have been poorly renovated and now look like generic vacation homes. 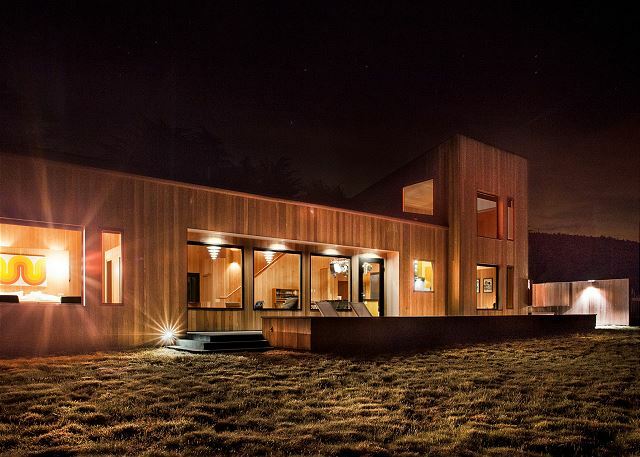 But this house screams SEA RANCH and we love it. Pros: new house, stunning interior, great proximity to beach trail. Cons: no BBQ, we had power/WiFi issues that had to be resolved during our stay, not very close to the more useable beaches (walk-on, shell, etc). It was excellent. We loved the house. The view was amazing. The only recommendation is to improve the lighting in the bedrooms. We would love to rent this house again. The Pool Room was a blast. We loved it. I was pleased by the smooth process of the experience, and though it pushed our budget a little, the house was wonderful, the environment was beautiful and we could not have had a better time. We had an excellent time. The house is extremely cool, with interesting architectural details everywhere you look. 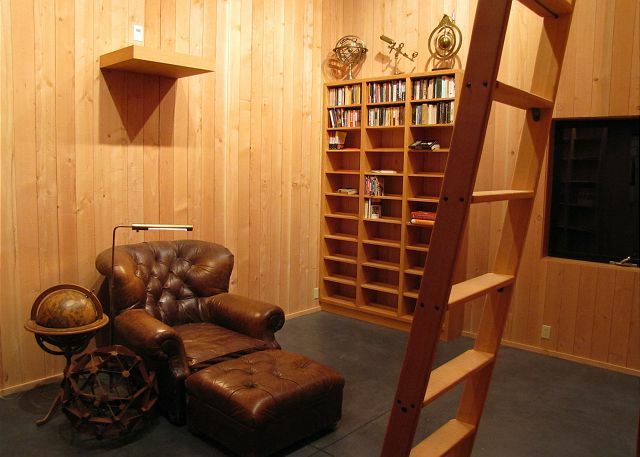 The main room is perfect for hanging out with your group without feeling cramped. Proximity to the water couldn't be better. Quite private. We had a great time relaxing on the window seats, cooking big meals, and playing pool. We were a group of 5 older ladies having a retirement celebration for 1 of us. This property provided everything we needed to enjoy each other as a group while having enough space for quiet musings. We enjoyed delicious meals at the Lodge as well as wonderful "home cooked" meals in the well appointed kitchen. There was some nice friendly rivalry in the nautically themed (that's an understatement) pool room and of course stimulating walks on the many trails in the area. But even if none of those things were offered, we all agreed we could have just sat on the patio the entire time and gaze at the lovely ocean view. It was so much more than we could have imagined and we shall definitely be back. We enjoyed a week at The Sea Ranch with our family a few weeks ago. We rented 2 homes, Horizon Reach being one of them. It was perfect. The kitchen is amazingly well stocked, the setting is probably one of the best, the "game room" is such a fun addition... can't say anything but wonderful things about this home. Thank you for an incredible family reunion, we'll be back! This is the 3rd time we rented this property. It is perfect for our family. Thank you for sharing such a beautiful home. 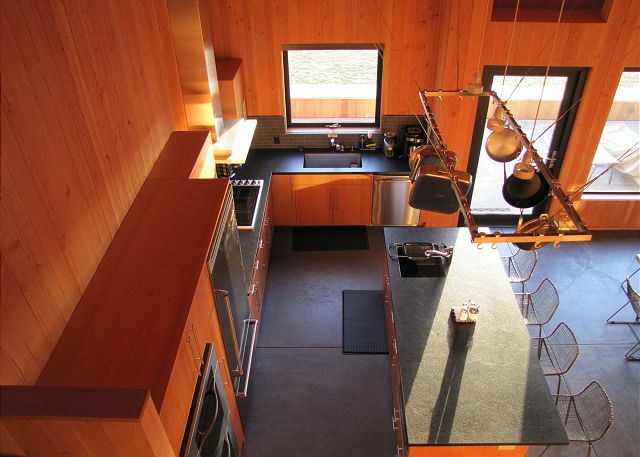 This house has great views, a fully-equipped gourmet kitchen, and comfy beds! The drive to get there is long (especially during rush hour), but it's worth it. Soak in the jacuzzi, take hikes along a scenic path, play pool in the pool room, read a book in the library, cook a yummy meal, watch a movie, or just relax. 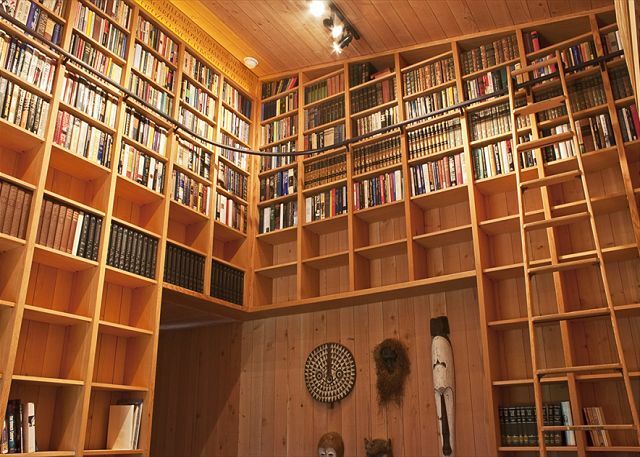 All of this is possible in this modern, well-maintained vacation home. This home makes for an ideal getaway. I hosted four friends for my 40th birthday weekend and we couldn't have asked for a better house. The views are incredible from every room. 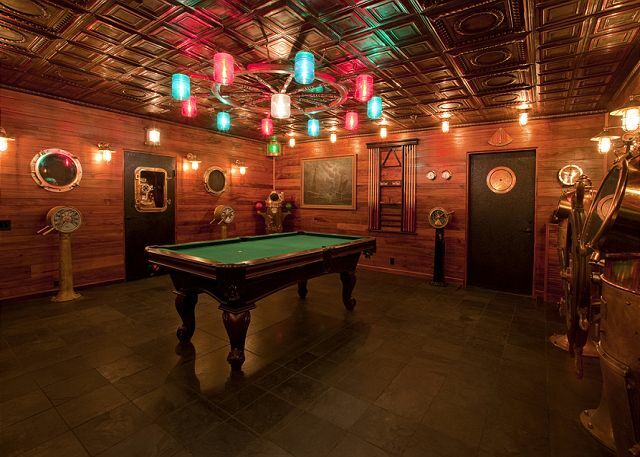 The house offers both privacy and unique communal spaces including a nautical-themed game room that is one-of-a-kind. We'd highly recommend this house! Horizon Reach is a very large house- perfect for 3 couples who need a little space. Large bedrooms, dedicated restrooms, and a lovely library for my 19 month old son to sleep in. The location is perfect- just off the walking path, and also walking distance to Moonraker Rec Center and a 1 mile hike to Two Fish Bakery. The house is immaculate, the kitchen is well stocked. The only downside is that BBQs aren't allowed. My family's time at Horizon Reach was wonderful. The views, the beautiful kitchen, the spacious layout of bedrooms, the architecturally stunning library, the pool table where we held many contests, the hot tub: it was all first-quality. The home is fairly new, beautifully equipped, and immaculately maintained. Our group of five found Horizon Reach perfect for a relaxing, restorative stay. It is spacious and comfortable, with spectacular views and great amenities. Well worth the price. We hope to return. Two notes to the owners--it would be nice to have a few more towels in the bathrooms, and the refrigerator was occasionally loud and may need repair. Our stay was great, we love the house. Perfect except for refrigerator not working. The four of us enjoyed our separate master suites ensuring luxurious privacy, cooking in the gourmet appointed kitchen, thrilled to migrating whales/calves right from our front deck, played pool and read from the library of thousands of erudite selections. The bluff location gave us ocean views on the first and second floors and complete privacy on all sides. The house itself is an architectural gem with high end finishes including radiant floor heating. We plan to return every year to this same house! I traveled to Sea Ranch with several friends to celebrate my birthday. We stayed for a long weekend and were all sad that we'd not planned to stay a full week. What a beautiful home in an excellent location! It was tranquil and relaxing. Our home was spacious and the kitchen had everything we could have asked for and more for our gourmet meals. We'll surely return! I expected Horizon Reach to be really wonderful and it certainly was. Our initial reaction as we checked out each room and the view was WOW! Everything about the house was above and beyond our expectations. Our group consisted of cooks and we enjoyed learning how to use an induction cook top. Being only 5 feet tall I could not reach the pots and pans but they were All-Clad and worth the effort. We loved everything about the house, the view and the walk along the cliffs (even the steep steps to get to the beach- we needed the exercise!) When we requested a better can opener it was delivered right away. 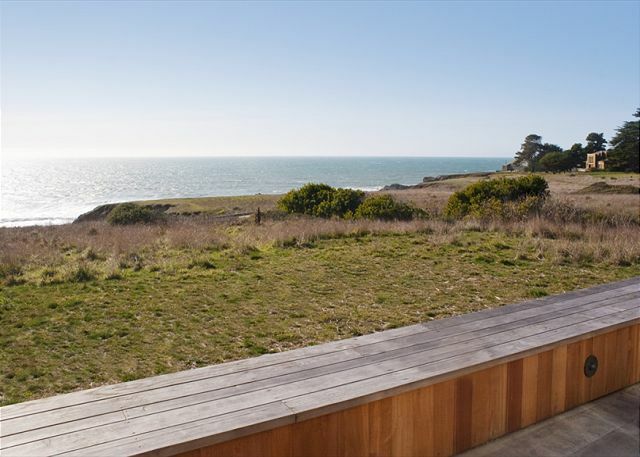 We have been renting in Sea Ranch for 20 years and this was the most beautiful house ever. We thoroughly enjoyed spending Thanksgiving week in this beautiful home! Each bedroom is special, the kitchen has every appliance for a gourmet chef, the pool room is fun, and the Library holds a stunning collection of beautiful books. I plan to return to this beautiful home. The views are breath-taking and the house is an easy walk to the Lodge. Beyond our expectations! !, a wonderful organized property. Excellent! 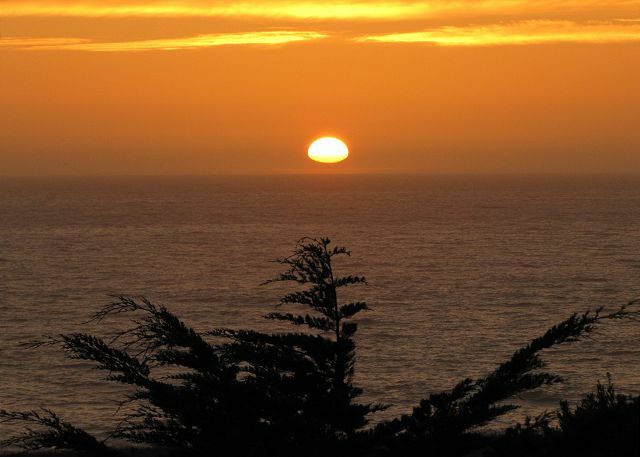 Have been to Sea Ranch many times so we know we love it there. This house was really great ...beautifully done and kept. Would definitely return. We rented this property with family from out of the state. They were blown away by it's location and amenities. 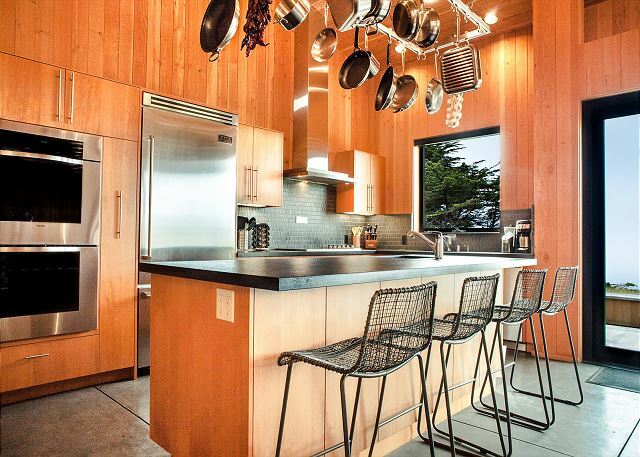 It is a very unique Sea Ranch rental, about as perfect as it could get. Lovely deck overlooking the ocean and another 2nd story deck too. Everything was extremely high end and modern. We have rented it once before and will definitely go back. Also, this house is very wheelchair accessible for anyone in a wheelchair. 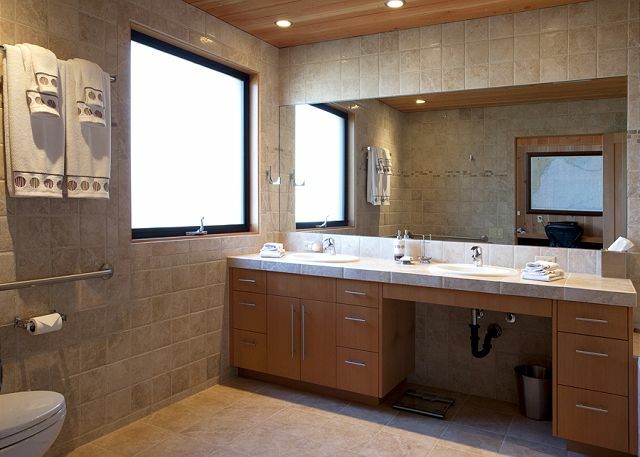 Only small step into the home at every doorway and the downstairs bathroom has a roll-in shower and sink cut-out. Amanda M from San Francisco, CA does not recommend this vacation rental. Thank you for another wonderful week away in The Sea Ranch. This home has breath taking views of sunsets and easy access to the hiking trail. Lovely house and location. Great kitchen, but Please, owners, add a webber grill.we bought one for the visit, but wouldn't want to do that each time. Modern architecture and design but with a cozy and comfortable feel. Stayed here with two other couples for a birthday weekend celebration. All three bedrooms are great in their own way. The ocean views are spectacular enough on their own. But the hot tub, reading room and maritime rec room put this place over the top. 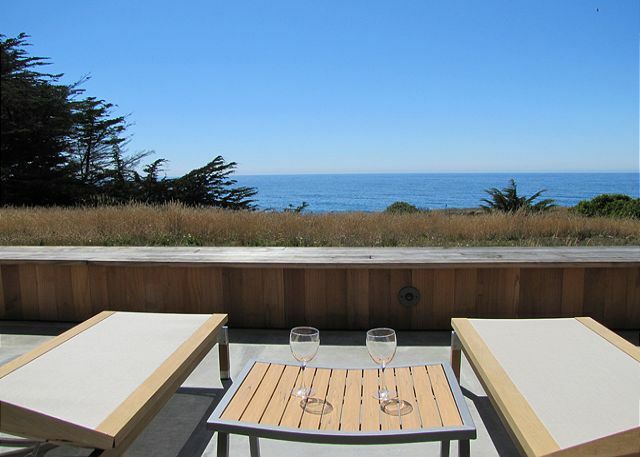 A definite must stay if you're looking for a place to rent in Sea Ranch or anywhere close to that area. The folks at beach rentals were fantastic. The house is beautiful, the beds super comfy. We had a wonderful stay at Horizon Reach. Beautiful house! Thank you. This outstanding home is full of delightful surprises! Modern light fixtures, artful chairs, a marine-themed pool room, an amazing library that includes a wood pipe organ, beautifully-equipped kitchen, on and on. 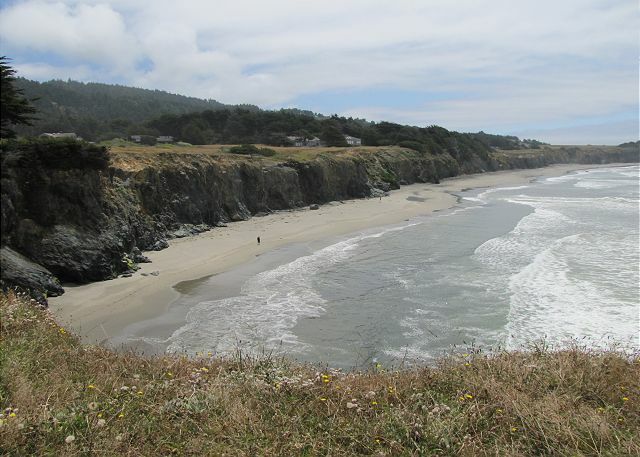 Plus, it's perched above expansive Black Point Beach for stunning views. I can't wait to go back! The Horizon Reach is a beautiful house at a beautiful location. It looks to be only a few years old - everything is in perfect condition and was spotless upon our arrival. It is very well furnished with top quality cooking equipment - allclad pans, lots of cooking gadgets, etc. The bedroom suites were quiet and the beds were comfortable. We'll definitely stay at the Horizon Reach again the next time we're up in Sea Ranch. This is the 2nd year we have stayed in the Horizon Reach house and it won't be the last! The house is perfect for 3 couples. We all get a master suite. The views are spectacular and we love the gourmet kitchen/dining/familyroom space. The sunsets and the sound of the waves crashing on the beach is addicting...you won't want to leave this beautiful house. I hate to give great reviews especially if I plan to go back and I want the house to be available when ever I want to go to Sea Ranch. But in fairness to the family that owns this house, I need to be honest. This house is fantastic. Great views, great house, love the 3 bedroom suites, love the kitchen with spices and every possible kitchen utensil, love the great room, live the pool room, love the library and so much more! The only complaint is that the stovetop was temperamental. I think some of the pans may have lost the magnetic bottom or the burner are bad. Also the refrigerator has a leak and makes a lot of noise. The rental company said that they were going to work on this. 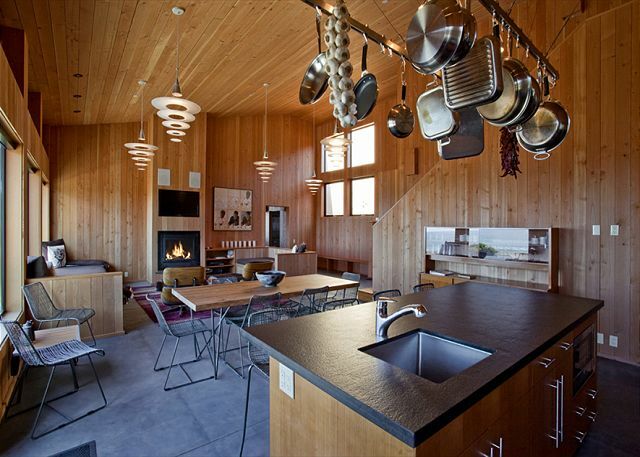 Overall my favorite rental house at sea Ranch. Our Stay was perfect, your really don't want to go home. We all had fun playing pool, watching the sunsets and looking for anything that may pass our sights as far as your eyes could see out to sea. Walks were fun, being able to leave right from your back door. Hot tub was like a little party with the lights and waterfall amenities. Kitchen perfect for my husband the chef, he had everything he needed. Very, Very comfortable in every way, a sure winner we will return to. My week away at Horizon Reach was relaxing and peaceful. Each room is thoughtfully appointed and private. I look forward to booking again to visit my new happy place. 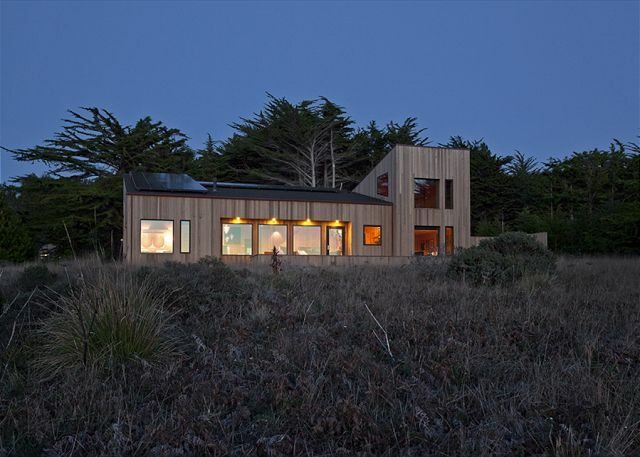 What a perfect Sea Ranch home. Modern, spacious yet intimate, gorgeous views, full of surprises and outfitted with all the comforts of home - and then some! Also a nice home for someone with mobility needs or in a wheelchair - single level with a roll-in shower in one of the bathrooms, only one step to get in home and onto deck. Thank you to the owners for sharing this lovely home! Catching up with friends from the past. An amazing weekend in an amazing location! This house is beyond imagination and the wonderful thing is that when you go with several cupples everyone has privacy so you don't suffocate each other and then really enjoy the time together. 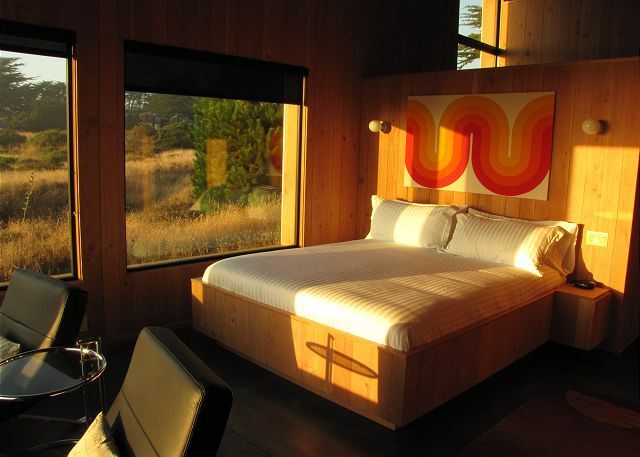 There is no bad bedroom, they are the same, magnificent views and incredibly comfortable. Throughout the weekend we kept saying how we could all live there forever. It is really designed for fun and relaxation. The location is stunning and he sunsets breathtaking. I remember everynight we would be in the middle of cooking dinner and we just had to stop to take pictures of the sun going down in the Pacific. Then when it got cold in the evening, we would go into the hottub, plenty big for everyone, and then laugh and talk until late night under the stars. One night two of us decided to sit outside to look at the stars with a cup of tea, wrapped ourselves in blankets and I can't remember ever seing so many stars. As we were sitting there, a little fox came to visit us. The last night we decided to play pictionary, I highly recommend it, it is in the library room. We laughed so hard we almost needed diapers. The whole weekend was a great bonding experience and pure fun and relaxation. We have decided to make it an yearly event. The house itself is beautiful, the pool room and library perfect spaces for adults and kids to enjoy. Kitchen beautifully located and well equipped. The house has blankets for sitting on the deck, towels for the pool. 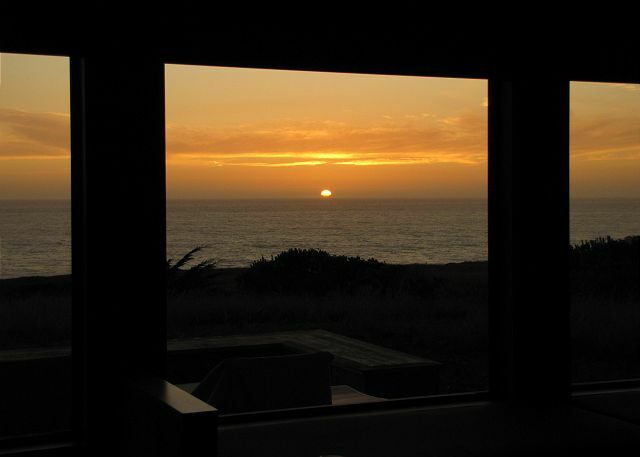 Everything is taken care of and it was the best house we ever rented in Sea Ranch. Thank you for a wonderful time. We very much appreciated and respected the architecture of the home--the design and relation to the landscape. It was perfect. Outstanding house and location. Everything provided for a comfortable relaxing stay at the coast. Screens on the windows would put this house at the top of the list. Note to all with pet allergies, property is advertised as a "no Pets allowed" house but is not a "pet free" house as the owners have a dog. After discovering a heater problem at the house we were to rent, the management at Beach Rentals quickly offered us 2 other houses for our stay. 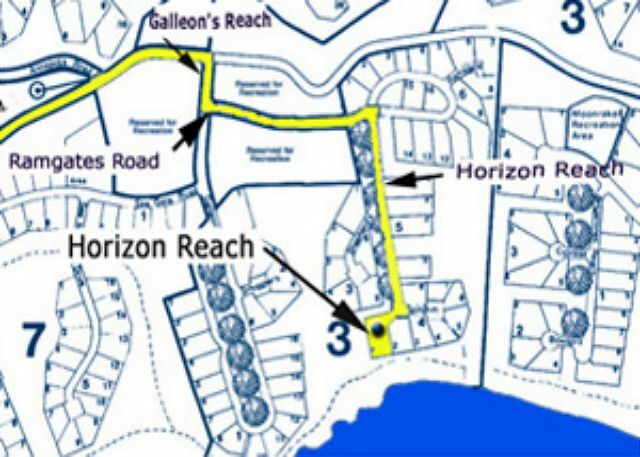 We chose Horizon Reach for it's size and location and could not have been more pleased. There were 6 of us and each couple had their own special master bedroom. Each bedroom had it's own bathroom including jacuzzi tub & shower which were located at different corners of the house giving a feeling of privacy and luxury. The great room where the kitchen flowed through the dinning area into the living room allowed for a coming together to enjoy cooking, game playing, and relaxing while watching the beautiful ocean out the windows in every room. The room with the pool table and the great library, with the unique musical addition, added an extra bit of fun. And, of course, the location on the bluff where we could walk out the door and enjoy walking along the trails of Sea Ranch was perfect. Stunningly designed and located, the house was everything we needed and more. The central living/dining room is spacious and comfortable, the kitchen well stocked with good quality equipment. 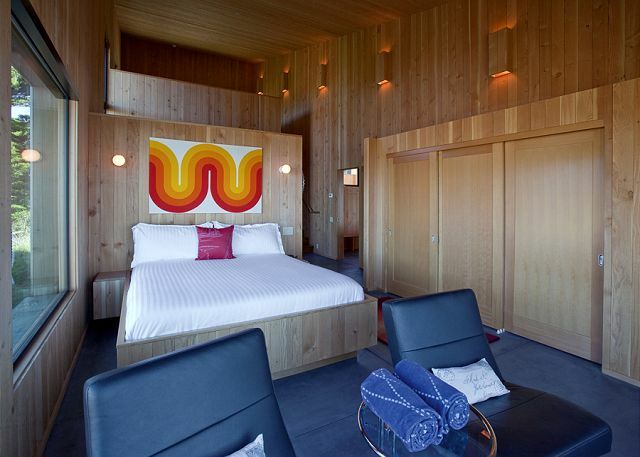 Bedrooms are divided on the two flanks, providing ample privacy, and the views throughout the house are stunning. The house and location were beautiful and the weather turned sunny just in time for us to enjoy walking along the coastline. 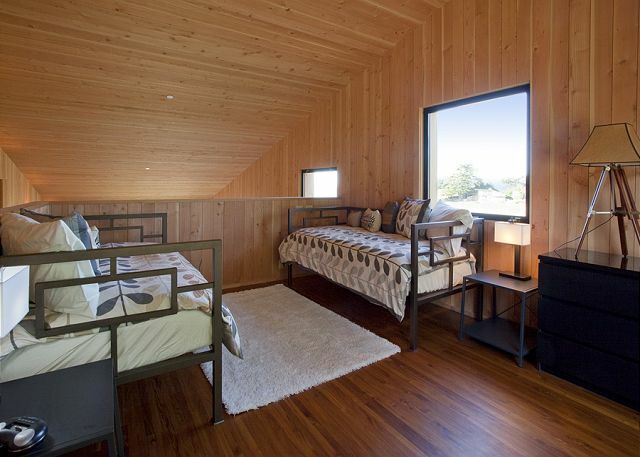 Horizon is amazing...the view of the stars at night from the master bedroom's three windows were breath taking. The home accommodated three couples for a family week end perfectly. Beautiful and wonderfully equipped. I only wish we could have spent more time there as we travelled each day to my son's wedding at Avil Ranch & Vineyard. I would highly recommend this house! Stunning views from living areas and each bedroom. Stellar architecture with simple luxurious furnishings. First rate kitchen, tv's and internet. Located on the bluff trail with sweeping views of Blackpoint Beach to the south. when families are next visiting. Loved the info packet about Sea Ranch and the local area - found it very helpful. The staff were also very knowledgeable/helpful and professional. I appreciated that they allowed us to bring our children with a deposit even though the property didn't typically allow children. Our family, 6 adults and 2 children, had a very good time. The location of the house is magnificent. The views from the living room / kitchen,and all the bedrooms,are spectacular. The kitchen has all the pots and pans and tools that is needed for creating good meals.The library has many excellent books on design and architecture. We question the selection of furniture for the living room. It could be safer and more comfortable. Jennifer B from Davis, CA does not recommend this vacation rental. The house is simply amazing. The setting on the ocean bluff is like a dream. This new home was spectacular. We loved the architecture, the light, and the lovely interior and felt so proud that we were staying in one of the nicest homes in the entire area. We may be bring friends the next time we go, or just ourselves again. But we will be back. Well-appointed and comfortable with ocean views and sounds from every bedroom and almost all common areas. 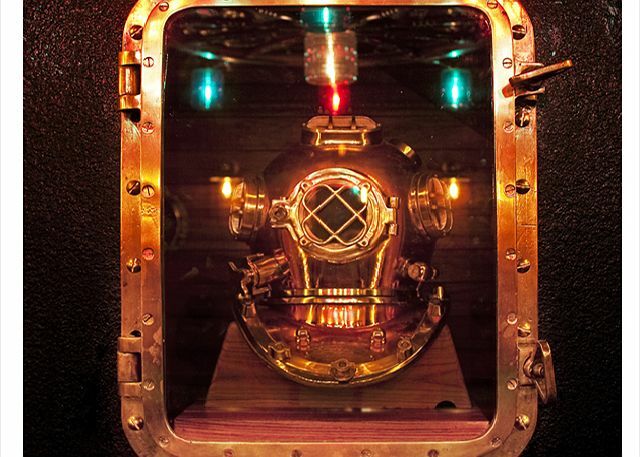 Highly recommended for anyone with a strong connection to the ocean. Lets' keep this a secret ! or else it will be become so popular you'll never get to stay there. Just look at the pics..and it's actually better !! Beautiful oceanside home. Great layout, lovely kitchen with new high end appliances, nice sound system, pool table, hot tub. Excellent ocean views.